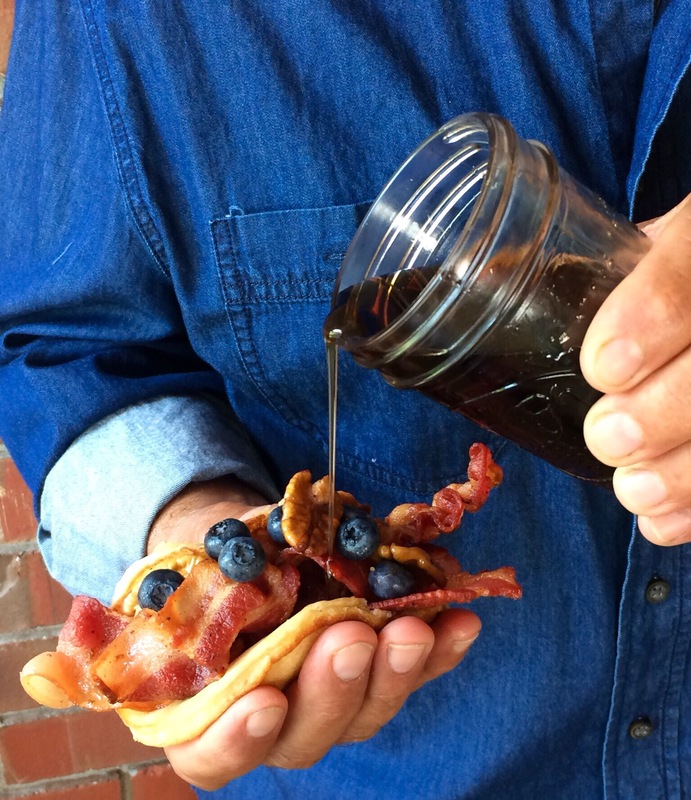 Crispy slices of bacon sandwiched between an old-fashioned style pancake, and then drizzled with syrup. This recipe was my Daddy’s idea… With his birthday this past week, I made his idea come to life. I started out with a good ol’ basic pancake recipe, one with no buttermilk, cause I know everyone doesn’t keep it in their fridge. Then just fry up some bacon and get out the syrup. I add fresh blueberries and toasted pecan, because those are my favorite toppings on pancakes. You can be creative and add different toppings to yours. I think these hand-held treats would make a great breakfast on the go. The kids can grab one before running out the door to school. 1)For this recipe thick cut bacon is best. 2)The best way to fry bacon is low and slow. I start cooking it on medium-high heat to get it started, then lower the temperature. 3)You want the bacon to be fried straight so you can lay it easily inside the pancake. 4)Don’t forget your melted butter in the microwave. Begin by preparing the pancake batter: In a large bowl, sift together the flour, baking powder, salt, and sugar. Make a well in the center of the dry ingredients and pour in the milk, egg, melted butter, and vanilla. Mix until smooth. Melt one Tablespoon of butter in a skillet over medium heat. Pour 1/4 cup of batter for each pancake. Cook each side for about 2-3 minutes. Keep the cooked pancakes warm in oven preheated to 200 degrees F.
Place bacon in a cold skillet, turn the burner on medium heat and cook until crispy. Once the bacon is cooked it’s time to assemble: take a pancake and place two strips of bacon in the middle, top it with your desired toppings. Fold up the sides and eat it like a taco. Enjoy !